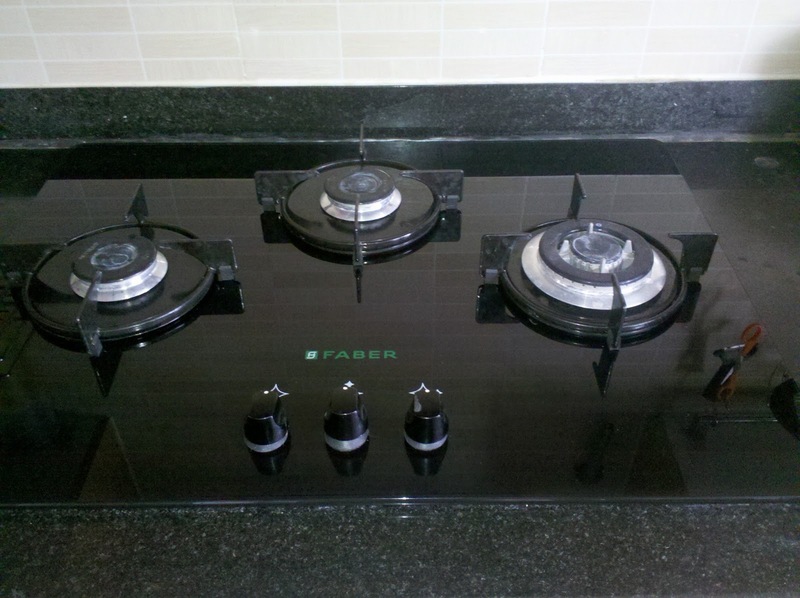 Faber Hob GB 30 MT - 3 burners, 72 cms. I wanted to start blogging from the new house with a happy post. At least a 'Wordless Wednesday' or a 'Photo Friday' picture! But no...you are made to read this ranting post of mine now! As you all now by now, we shifted to a new flat on 12th of this month. We did the 'Gruhapravesh' in November, believing the assurance given by our builder that we could move in, in January! So we had ordered for the 'Modular kitchen' with Dynamics marketing, Annanagar, Chennai. They supplied the material on 28th Oct. '12 and everything was fixed in the kitchen on time. Very good service too! We were very happy about their work. The builder had finished 95% of the work and we moved in on 12th of this month. Still some minor work is going on! The trouble started yesterday with our new stove! Yesterday morning I was cooking and was on the phone, standing a few feet away from the stove. Suddenly something hit my stomach and I heard some bursting sound. I looked here and there and found small pieces, solid pieces of glasses near my feet and near the dining table which was around 4-5 ft. away. Then I noticed the glass table of the stove had cracked like some design...Have a look! All 4 sides of the glass top had cracks like this! You can see the tiny pieces of glass like we see on the shattered car windows...hardened glass! This was the only vessel which was on the stove...no gas leak and the glass was cold when I touched it! I took this picture as soon as I noticed the disaster! This happened at around 8.30 a.m. We waited till 10 and called the Dynamics Marketing people who had supplied this stove along with all the kitchen appliances to us. Their man came within 2-3 hours ...but was saying that it is already 7 months since you had bought this stove....but we had started using it from 12th June, we said. He said that he would ask the Faber people to come and have a look. They came today morning and asked questions if I smelt gas when the glass burst. I said 'no'. The glass was cold and I had continued cooking and am continuing cooking! He asked for the warranty card, which was reasonable. My husband, while dismantling things, so many were there...the new stove, Faber chimney...new taps, sinks...you know how it is in a new house....had collected all the warranty cards and kept them in a bag and since our house is still in a mess, we couldn't locate it. But we found the delivery challan of Dynamics marketing in which the name of the stove is mentioned and we told him. But he was after the warranty card or we were asked to pay Rs.4000/- for a new glass top! I had used the stove from 12th to 27th June and they wanted us to shelve another Rs. 4000/- on that stove. The stove costs Rs.8000/-. We refused to pay and complained to Dynamics again. We are still waiting for somebody to visit us! We are searching for the warranty card now! I spoke about this to my friend in Bengaluru and she said that she had been using the same stove for the past 2 and a half years and the glass top was replaced(!) free of cost (!) twice...! I should have asked her before going in for this Faber Hob! I definitely wouldn't have bought this! I think this is a common problem with this stove. 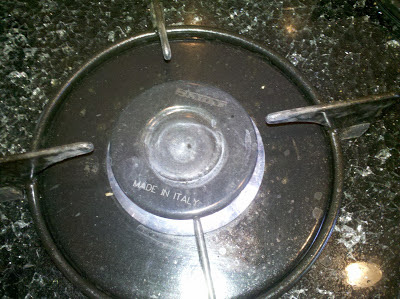 This stove is an Italian make. I should have checked the burner also before buying this stove. They are not like our normal brass burners on which even small vessels can be kept and the flame would be within the base of the vessel. In this burner the flame spreads around the base of the vessel and no flame comes in the middle of the burner. This is useful for cooking with broad, big vessels. But with this table top model, the burner will be like this, I was told! You can notice the cracks on the glass top here around the burner. I am worried whether to wait for the Faber people/Dynamics Marketing to take action or should I stop using this stove now? I don't want to shelve another Rs.4000 on this! 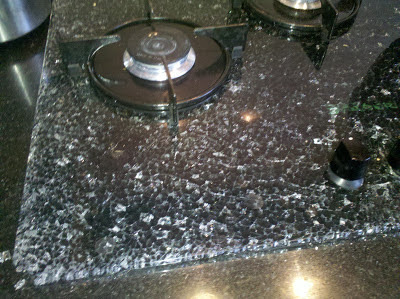 Will the glass collapse if I continue cooking on this, waiting for those people to do something? Has any of you had this experience? The stove looks sleek, though! P.S. : I still don't have the net connection in the new place. I came to the old house to write this urgently! But will check the comments in my mobile! Waiting to read your opinion! Airtel people are not capable of giving connection in our new flat. All the new tenants are going in for BSNL now! Wish us luck please...I have heard that the connection is very slow! I got the glass top replaced last evening and got the BSNL net connection also last evening! We didn't pay anything for the replacement. I got the warranty card also but it was useless since no stamp of the dealer was there! Same with Faber chimney...no stamped warranty card! We have to be alert all the time...a little lethargy will cost us a lot. We didn't get the separate receipts for the gadgets. The dealer gave us a chalan with the list of things he has fixed for the modular kitchen! This is an experience! But the dealer and my husband spoke to many people in the Faber office and got the glass fixed! My blog friend SG (see in the comment section pl. )also had forwarded my post to the higher authorities. I don't know which one worked. I forgot to tell you one thing! I had got a normal 3 burner stove in the beginning. It had come to the flat also. But since many people said that this stove will look nice in the modular kitchen (this is the first modular kitchen I am using! ), we had changed it to the new sink-in stove! 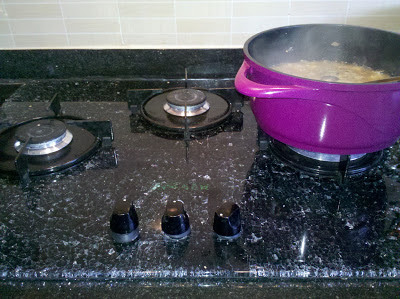 The 3 burner stove was sleeping in the flat for a month before changing! Time....! Now, will acknowledge the comments of all the well-wishers shortly! Apitha Iyer Manni,you should stop using the stove and do what some blogger has suggested in her comments.The western burners are really bad .The flame goes to the side and takes a long time to heat. I replaced my Kaff hob with Padmini hob with indian brass burners which works very well. Sandhya Hariharan mami, had i known u were going to buy faber, i would have told u not to buy... we had the same faber in our house and we were in the kitchen all the time. the consumption of gas is also very high and its not suitable for our kind of cooking. there was even an article in mangaiyar malar based on my experience. Apita and Sandhya...thanks for the useful comments! Had been to Bangalore. My friend had paid for the glass tops both the times, when they broke, because the warranty period had elapsed. Now, she has kept the stove in the attic and has bought a new one with aluminium top. She too is advising people not to buy the Faber glass top. (Kaff is good, it seems. The glass doesn't break. A neighbour is using it for the past 4 years!) She too doesn't know the reason why it broke. The dealer should tell us what to do and what not to do, when we opt for buying this glass top. Then we can go for it if we can handle it. I used it only from 12th to 27th this month. I didn't do much cooking too and I didn't had any guests! Minimum cooking. Now, if the glass breaks again, I will go in for some other brand and no more glass tops! Edited to add on 11.12.14: I think I should add this message now. I don't seem to have any problem now except I can't make a cup of chai in a small vessel. As I said before, the flame goes out of the vessel. Hope the company does something for this in the future! Please complain to the Faber company, and tell them about the way the distributor was harassing you, and also asking for more money. Take it up be writing to to higher authorities in the company and tell them you would go to the consumer court, and get compensation. Also tell them you got hit by glass pieces which very dangerous. You should stop cooking in that stove. It could burst again and next time you may not be so lucky. And record the conversations you have with people coming from the dealers also in your phone. Mine is also Faber but it is steel and is giving me good service for the last 13 years.Regarding the vessels you can get it altered to suit our cooking pans, otherwise use it like that only. I didn't get mine changed though most of my vessels to are not suitable for this kind of stove. RAMA: This is a famous brand and I never expected to face this type of problem, Rama! I had seen these stoves in the exhibitions and was planning to buy one day. Hope they fix it up fast! In fact,I was missing your blogs here on the blogosphere for long. BK CHOWLA; Thank you, Chowlaji! Once we get the net connection, I will be active here. Miss reading all the posts of all of you, Chowlaji! Will catch up soon! 1. Whoever is asking you for money, threaten them that you'll go to consumer court. 4. Repeat the above with Dynamic marketing as well. Tell them their reputation is at stake. I am sorry you had this bad experience in your new home. First of all, I am happy you did not get hurt (standing close to the stove). Please do not cook on that stove. It is dangerous. Please call the CEO or any high ranking mucky muck in that company and complain. If you can sweet talk the secretary to giving that mucky muck's email address, write to that person. Good luck to you. Please keep us posted. Good to read from here again! It gets them to take notice. I do hope they attend to your problem quick. I feel that there is no point in replacing the glass, especially as this problem could recur. Why don't you buy a normal stove instead? BSNL connection is quite fast - It depends on the area, actually. Replacing the glass doesnt seem like a good idea, because it may again break right? I feel it is better to replace the stove itself. BSNL is very fast at our place though. Like DI said, it depends on the place I think. I have nevr faced this, so cant say, but happy that you didnt get hurt. Please complain to the Faber company's head office.. they will provide a better solution to you. Hope things sort out soon for you Sandhya. Pls take care and stay safe more than anything else. Gud luck with getting the net connection. My aunt has the issue with the flame not being right, for our vessels. She still has it, and gets annoyed everyday, but can't replace it because it was so expensive. You know you could tweet about this, and see if there is a Faber twitter id. I have a feeling that tweeting might force yhem to react faster. And yes, do try emailing the head office, they might be more proactive in such cases. This is dangerous, they should sort it put for you immediately. Good to read you again, Sandhya! Good that you blogged about this problem at hand, you could also send a mail to Faber and to the company who supplied you with the stove. Keep pursuing them till they solve it for you. Unfortunately, these products have very poor after sales service but taking the route suggested by Shilpa may help! Do complain to Faber. Don't let these people get away with this. Tell them that you will write to a senior official. Hope they fix it soon for you. Did they changed the stove or not?? If you had not taken net connection, i advice you to take AIRTEL, their service is awesome and it's cheaper than other service provider..
Oh Sandhya, I am so sorry to hear about this dangerous accident. Thank God you were not hurt more seriously. Dear Sandhyaji, I wish you good luck with the internet and the stove, hope you find the warranty card and the problem gets sorted soon. SHILPA: Thanks a lot for the ideas! We asked the Dynamic marketing to replace the stove with a steel top instead of this, after we got the replacement yesterday... But he refused. At least we didn't pay for the replacement. I think this is a grave mistake on my part, selecting this stove without checking the burners...First, I had selected an ordinary 3 burner stove, checking the burners etc. It was good. But the sales lady was telling that most people chose the sink-in stove in modular kitchens. I told her at that time that I am too old for trying new things! The 3 burner stove came to the flat too with other things. It was not opened at all. Again some people said that the sink in stove would look 'nice' in the modular (beautiful!) kitchen. Then husband went alone to the dealer (I should have gone and checked the burners and again checked about the glass top, which was a grave mistake!) and got the stove! Thanks for the sincere tips, Shilpa! SG: Thanks a lot, SG for expressing so much support. Faber replaced the glass top, free of cost, last evening. The dealer and husband spoke to many people in the company and your mail also might have helped...anyway, the stove is good again...though I don't like the burners! I bought it without checking properly. I got the BSNL connection yesterday evening. Should wait and see how it works! DESTINATION INFINITY; I had bought the normal stove first...but changed it and the result is too bad! Have started using BSNL from last evening. Let me see how it works! Around 15 people are using this connection now in our complex. It is just OK. Everyone prefers AIRTEL! AVADA KEDAVRA: The glass top has been replaced by the company, free of cost. Yes, I should switch the stove. We can't exchange, it seems. Should wait and change it soon. Got the BSNL yesterday. Will know how it is, in a few days! SHARU: The glass has been replaced, Sharada, free of cost! I got the BSNL connection yesterday. Will wait and see how it works! Got the BSNL net connection, last evening! SMITHA: Thank you, Smitha! I got the replacement yesterday after a lot of effort from the dealer and my husband! I got the replacement yesterday. Hope I can use this stove for sometime and but a new 3 burner stove after a year or two. I must try to use it for sometime at least...we have paid so much! SM: Thank you sm! The glass top has been replaced! RAHUL BHATIA: Thank you Rahulji! Faber replaced the glass top yesterday. Hope I don't get this problem again! RACHNA: The replaced the glass top yesterday, Rachna, thank you! AS: I agree with you, AS! I should have gone for the steel top! VARUNAVI; The glass top is replaced, Saritha! Did you check with your friend? Thank you, Saritha! AIRTEL is not available here, so BSNL, for now! R.RAMESH: The glass top has been replaced after a lot of effort though, for free! ZEPHYR: Got the glass top replaced, yesterday, Zephyr! Husband and the dealer were after the company and did it! Yes, I should have gone for Superflame, which is a very good stove! Thank you, Zephyr! SAI CHARAN: Thanks for the wishes, Sai! The glass top of the stove has been replaced and we are settled now! The flat is very good and we are happy to be here! All the best to you, Sai! 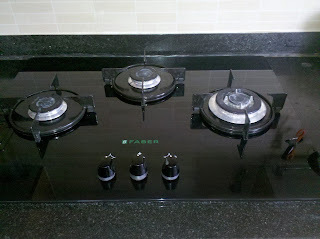 Sandhya, we have installed a glass top hob (or sink-in stove) in our new home as well. It is from Kaff. But my in-laws installed the same thing made of steel/aluminium. So, you get hobs that have glass as well as steel tops. Anyway, if the issue recurs (lets hope not), you must throw the stove at the service person/Faber dealer and ask for a new stove + damages. SHILPA: Hope this glass top doesn't give more trouble. We are also thinking of dumping it if it happens again. 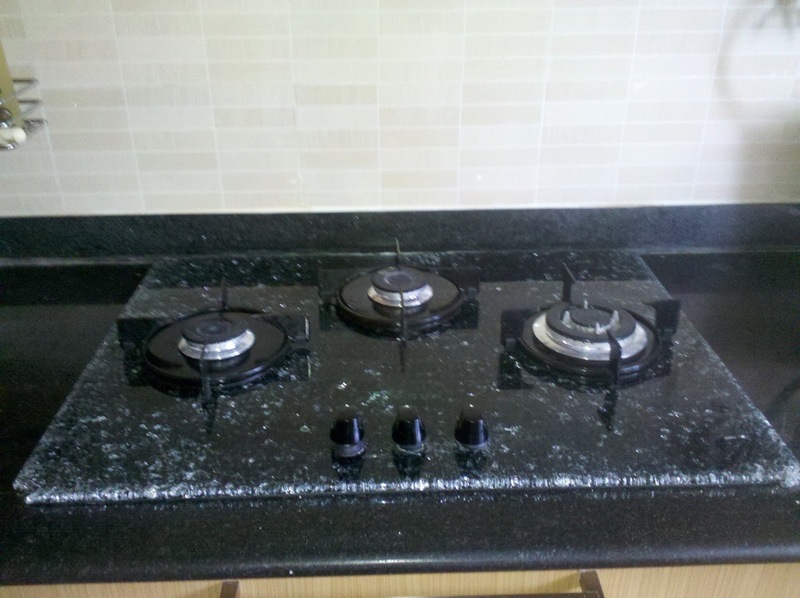 My friend in Bangalore who had the same problem has changed her stove now. The Faber hob is sleeping in her attic. She is residing in a huge complex and everyone knows about the flaws of this stove now, there. I should have asked for her opinion before going for a hob! How is your padmini stove or hob? PRADEEP: Welcome to my space, Pradeep! I have written a footnote for this post. I don't have any problem for the past, more than a year now! It is easy to maintain too. I have no experience with glass top or hobs.. but i once had a Glen 2 burner stove. It was like our indian stoves, with brass burners and everything. But a year later, the flame started becoming big. The gas was being used very soon and we are a small family with minimum cooking. I took it a local service center in one of the vessels and metal stores. The boy there asked me to leave it there and come back later in the evening. I collected it and paid a very minimal amount. Then when I again lighted the stove, same problem. I went back and asked him. He said this is imported brand, we dont have gas valve for this. So he went ahead and replaced it with butterfly's valve without checking with me. Then I had to call Glen service center. They charged a hefty amount of around 500 for the visiting, valve and maintenance. I was fed up. If a simple gas valve had cost me so much I couldnt think of anything else. Then an experienced shop keeper at a vessel shop nearby told me to replace this with an indian brand. I immediately replaced it with Premier stove. I have been using this for the past 4 years and no complains. My lesson was to never buy imported brands as their parts and service can be very expensive. Glad that your problems have been solved. MRS.TJ: We get all types of gadgets in India itself nowadays. This came with the modular kitchen for us. But didn't complain because we never expected this problem to arise. But now, it is OK. I am used to it too! PRIYANKA: Welcome to my space, Priyanka! Thanks for the comment! Hi Iam planning to buy a hob.can anyone suggest me at present tym which is the best one.faber ,kaff ,elica or padimi.please guys help me.I'm in dilima.by March 1st week I must buy it.